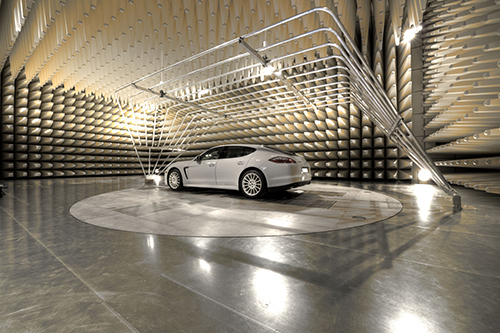 The challenging demands of automotive R&D testing require anechoic chamber solutions that are the most technically capable & adaptable in the world. Fuseco has expertise and experience in providing EMC test equipment for pre-compliance or full-compliance systems as well as an extensive range of complete EMC Chambers (Anechoic/Semi-Anechoic Chambers) for for conducted and radiated emissions/immunity testing. Our objective is for our clients to obtain great value and efficiencies from their investment in their EMC chamber assets. For this reason, we focus on attentive after-sales support to create a long term partnership relationship with our clients. The Fuseco team are responsible for some of Australia’s premier EMC chamber installations. Coupled with the capabilities of Frankonia, Fuseco is Australia’s leading EMC technology partner. What is EMC (Electro Magnetic Compatibility)? EMC means "an electronic or electrical product shall work as intended in its environment. The electronic or electrical product shall not generate electromagnetic disturbances (interference), which may influence other products". In other words, EMC deals with problems of noise emission as well as noise immunity of electronic and electrical products and systems. Electromagnetic disturbances occur as conducted interference as well as radiated emissions and immunity problems. An anechoic chamber is a room designed to completely absorb reflections of electromagnetic waves used for various EMC Testing. They are also insulated from exterior sources of noise. The combination of both aspects means they simulate a quiet open-space of infinite dimension, which is useful when exterior influences would otherwise give false results. The RF anechoic chamber is typically used to house the equipment for performing measurements of antenna radiation patterns, electromagnetic compatibility (EMC) and radar cross section measurements. EMC chambers allow for the performance of fast and efficient EMC radiated tests at a convenient location, without interference from the ambient electromagnetic environment. The term conducted emissions refers to the mechanism that enables electromagnetic energy to be created in an electronic device and coupled to its AC power cord. Similarly to radiated emissions, the allowable conducted emissions from electronic devices are controlled by regulatory agencies. If a product passes all radiated emissions regulations but fails a conducted emissions test, the product cannot be legally sold. The term radiated emissions refers to the unintentional release of electromagnetic energy from an electronic device. The electronic device generates the electromagnetic fields that unintentionally propagate away from the device’s structure. In general, radiated emissions are usually associated with non-intentional radiators, but intentional radiators can also have unwanted emissions at frequencies outside their intended transmission frequency band. Conducted Immunity (also called Susceptibility) is a measure of the ability of electronic products to tolerate the influence of conducted electrical energy from other electronic products and electromagnetic phenomena. Radiated Immunity (also called Susceptibility) is a measure of the ability of electronic products to tolerate the influence of radiated electrical energy from other electronic products and electromagnetic phenomena. Which test method to use for Conducted Immunity? The test signal, amplitude modulated by a 1 kHz sine wave, is injected onto the AC or DC wires via a Coupling, Decoupling Network (CDN) while the frequency is varied. Unshielded cables can be tested using either a CDN, coupling clamp or current injection probe. Shielded cables are tested using direct injection, the signal is coupled through a 100-Ohm resistor onto the shield of the cable under test. The injection level is pre-calibrated using the appropriate calibration jig and is equivalent to the open circuit voltage at the output from the amplifier for an unmodulated signal. We have a Frankonia SAC3Plus EMC chamber that we use for commercial testing. We have some height limitations in our laboratory and its dome shaped design fits very conveniently. We are happy with the performance of the chamber and their absorber design is great. No carbon dust and falling of foam absorbers. Previously we had carbon foam-based absorbers and we literally had to wear a safety hat before entering the chamber.